The Heartbreak Kid Shawn Michaels has heard all of your "one more match" chants and he's seen all the rumors on Twitter and he's read all of your fantasy booking, but thanks-but-no-thanks, he's good. "I'm going to hurt my greatness over the years because I don't continue to hint and bait, and make people anticipate, or milk it and put everything over, but there is no itch to scratch," Michaels told ESPN.com. "I'm one of those people who would be OK with fading back into the background a little bit." He appeared on Raw on January 9, to plug his new faith-based movie The Resurrection of Gavin Stone, then did a backstage interview which you can watch at the top of the page. In the interview, he said this: "If I have done nothing in the last seven years, I have done my best to show people how to actually retire from this line of work." However, he had to go back to working us with his final line: "Of course in the WWE, you just never know what is going to happen, right?" But really, Michaels says he's been under no pressure to return, nor from Vince McMahon and not from Triple H.
"It's funny because the two guys who really make the decisions, which is Vince and Hunter, in seven years have never even approached me," Michaels said. "I guess I'm semi-amused that people think 'Vince is saying this' and whatnot because those are the two people that understand why and respect why I retired and understood it." And while he's flattered, and he admires AJ's acumen for getting the people worked up, he says he just ain't gonna happen. "I think he's not only gifted in the ring, but he understands that the work doesn't stop there. It's about creating talk and constantly being the topic of conversation. He understands that. "I have no doubt that LeBron James would've loved to have played against Michael Jordan, but that simply is not going to happen. But I've got to tell you that I appreciate the free press. I'm a guy that has absolutely no problem flying under the radar and not being talked about. My name has been out there for the last three months thanks to him doing that." However, if HBK was going to have one last match, hypothetically, it wouldn't be against AJ Styles. There's another former TNA stand-out that's currently on the WWE roster that he rather tussle with. "I look at Samoa Joe and I've told him a number of times that I see his stuff at NXT and think to myself, 'Man, I could have a great deal of fun with you,' " Michaels said. "He's a guy I have sort of enjoyed, and one of those sleeper guys that no one talks about. "We have contrasting styles. I get that everybody wants to see me and AJ or Seth (Rollins) or Dolph (Ziggler). From my standpoint, I think really telling a great story out there [is most important]. 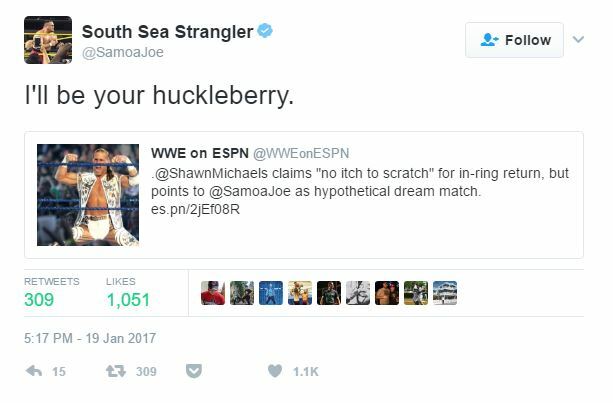 I could do it with a guy like Samoa Joe. His stuff looks really good, and sometimes he just looks like he's beating the tar out of somebody." Wow. That would certainly be something to behold. WWE booking office, I hope you're seeing this.